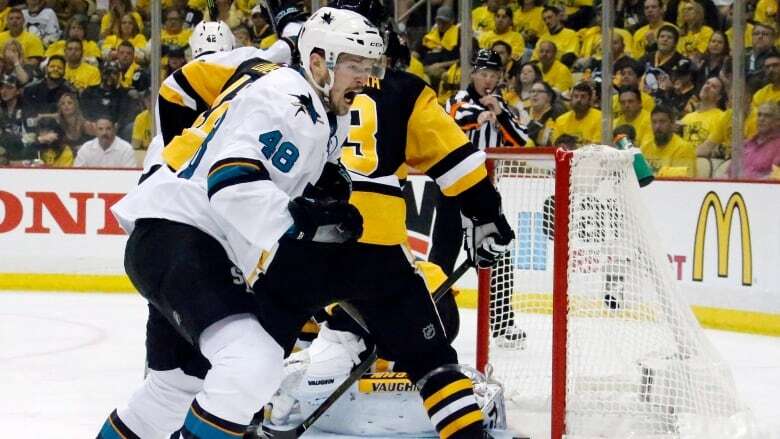 The status of San Jose Sharks winger Tomas Hertl is in question for Saturday's Game 3 of the Stanley Cup Final. The 22-year did not practise Friday morning. Head coach Pete DeBoer said Hertl's absence was for "maintenance." "He's got a little something," DeBoer said. "(We) just kept him off (the ice)." Hertl did skate briefly in a tracksuit beforehand and will likely be a game-time decision for Game 3. The Sharks are back home after dropping the first two games in Pittsburgh. Hertl was replaced at practice by 25-year-old Melker Karlsson. Playing in his usual spot alongside Joe Thornton and Joe Pavelski on the Sharks' top line, Hertl had two shots in more than 20 minutes in a Game 2 overtime loss. He has six goals and 11 points in the post-season following a career-high 21 goals and 46 points during the regular season.